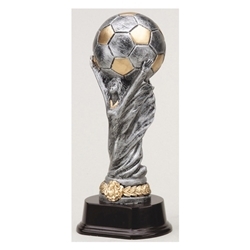 Soccer World Cup Replica Trophies are available in 3 sizes: 6.25", 9" and 12" so they are perfect for Tournament Prizes. This impressive Soccer World Cup Trophy includes a free personalized name plate on the base. This is next closest thing to having attended the World Cup. Item Size 6.25", 9", or 12"